This interesting looking device is the Sony Tablet P. You can connect to the web via WiFi or 3G and there’s two 1024×480 5.5″ Ultra-wide VGA screeens. Other specs include a microSD card slot, Bluetooth 2.1, two cameras (5 megapixel around the back with HD video recording and a VGA up-front), 4GB of storage and the usual sensors and compasses. Arriving in November, the “innovative folding design” has the same NIVIDIA® Tegra 2 mobile processor as the bigger Sony Tablet S devices and costs £499.99. The clamshell handset has the Sony TruBlack screen and weighs in at just 370g. It PlayStation Certified and again comes with “Video Unlimited” and “Music Unlimited” for renting and playing music and video content instantly. Android 3.2 powers this and there’s headphone and USB connectivity. The innovative design of “Sony Tablet” P features dual touchscreens that can be used for different functions. Watch video on one screen while using the other to control it, or check email while using the other screen as a keyboard. The two displays can be combined into a large, single screen for web browsing and more. Its folding design achieves a compact form factor for easy carrying in a jacket pocket or bag. Flip “Sony Tablet” P on its side and read eBooks in comfort, just like you’d read an ordinary book. Get more info in the press release below. Sony today announces the market launch of its first two “Sony Tablet” models. These devices combine unique hardware, content and network services with seamless usability to create an exciting new world of network entertainment experiences. Available in Europe from the end of September 2011, “Sony Tablet” S is optimised for “rich media entertainment” on its 23.8cm (9.4”) touchscreen display. With the powerful NVIDIA® Tegra™ 2 mobile processor inside, “Sony Tablet” S lets you enjoy the web plus your favourite content and applications on its large, high resolution screen. Weighing 598g (approx.) (Wi-Fi version), its unique asymmetric design conveys a sense of lightness for hours of comfortable use. A Wi-Fi/3G version of Tablet S will be available from November 2011. Also available from November, “Sony Tablet” P is geared for “mobile communication entertainment”, with an innovative folding design and dual screens for maximum portability. Weighing 372g (approx. ), “Sony Tablet” P features the same NIVIDIA® Tegra™ 2 mobile processor and offers connectivity via Wi-Fi and 3G mobile networks. Dual 13.9cm (5.5″) touchscreen displays can be folded to achieve dimensions of just 79x180x26mm (approx.) to fit in a pocket. Wi-Fi only models are equipped with Android™ 3.1 (To be upgradable to Android 3.2) and Wi-Fi/3G models are equipped with Android 3.2. 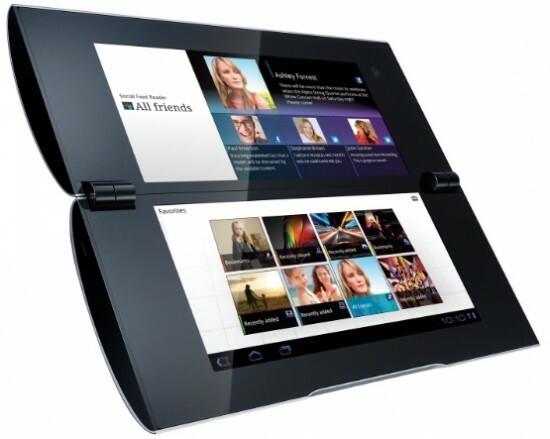 Both “Sony Tablet” models feature front and rear facing cameras for still and video image capture. USB 2.0 port and SD card slot simplify direct file transfers from other devices such as PCs, digital cameras or camcorders. “Sony Tablet” S features a new unique asymmetric design which allows it to be easily held for long periods of time. The unique form factor shifts the device’s weight closer to your palm, making it feel lighter and more comfortable while reading a book or magazine. The screen slopes gently when placed on a flat surface, enhancing visibility and making typing more comfortable. Available as an optional accessory, a special cradle converts “Sony Tablet” S for use as a digital photo frame or digital clock. Both “Sony Tablet” models are equipped with TruBlack™ technology by Sony. By controlling the refraction of light between the LCD and the screen, the TruBlack™ display reduces reflection and glare from sunlight or fluorescent light for high-contrast visibility both indoors and out. Quick view: Sony’s rapid response technologies efficiently load website information for faster browsing. Quick touch: Highly responsive and smooth touch screen is realized by combining various Sony technologies. The large keys of the virtual keyboard take full advantage of screen real estate while automatically adjusting to the task in hand. For example, a numeric pad pops up when inputting passwords, while auto word complete makes email and texting a breeze. Both “Sony Tablet” models offer smooth, seamless access to an exciting world of network entertainment and content services1. · “Sony Entertainment Network” services: “Video Unlimited” will have a huge range of movies and TV episodes available for download. A pre-open campaign for the Sony Tablet devices will be offered at device launch with limited content and more content will continue to be released over time. Available in October, “Music Unlimited” is Sony’s cloud-based digital music service that gives access to a global catalogue of over 10 million songs2 from major labels, leading independent labels and publishers worldwide. · PlayStation®Certified: “Sony Tablet” S and “Sony Tablet” P are the first tablet devices that let you enjoy games for PlayStation® Certified devices including original PlayStation games. · Reader™ Store: A rapidly-expanding catalogue of eBooks and periodicals will also become available in Europe, coming first to the UK scheduled by the end of October, and Germany within this year. Successive launch of Reader Store in France, Italy and Spain will begin in spring 2012. Ideal for on-the-go reading, book lovers can set bookmarks, make text highlights and adjust font size. · Personal Space™：This free, cloud-based service makes it easy to share pictures and videos stored on “Sony Tablet” with friends and family. 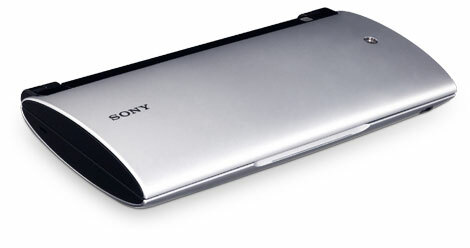 “Sony Tablet” can also be used to access albums that have been previously uploaded from other devices. Video, music, games and other content can be directly accessed via “Favorites” menu without the need to re-launch any of the respective applications. 1 Availability varies by country. “Sony Tablet” lets you control your home entertainment devices and share content wirelessly with friends and family. Personal photos and video content can be ‘thrown’ (streamed) at the touch of a button from “Sony Tablet” to DLNA-compatible TV sets and other devices. Music can also be streamed from “Sony Tablet” to wireless speakers. “Sony Tablet” S includes infrared technology, and can be used as a fully customisable remote control for multiple home devices including your television, Blu-ray Disc™ player and home theatre set-up. Both “Sony Tablet” devices are compatible with “Media Remote” which allows users to control Sony devices including “BRAVIA” through Wi-Fi. 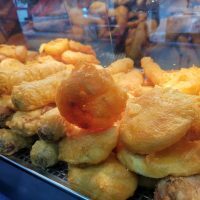 · Social Feed Reader combines Facebook and Twitter into a single feed for easy and convenient viewing. · Music Player lets you browse your music library, create dynamically themed playlists with SensMe™ channels, view cover art and visualisations and get related online content. Touch an icon on screen to ‘throw’ music wirelessly from “Sony Tablet” to enjoy on other DLNA networked devices like your hi-fi system. · Video Player lets you browse and playback video content with a wide range of view modes, search scenes and ‘throw’ video to watch on other DLNA networked devices like your “BRAVIA” TV. Accessory options include AC adaptor, rechargeable battery (for “Sony Tablet” P), LCD screen protector, a variety of carrying cases, USB adaptor cable and Bluetooth keyboard. 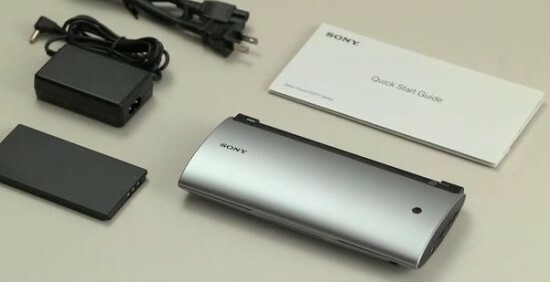 “Sony Tablet” S is available from the end of September 2011. “Sony Tablet” P is available from November 2011. Exact date of availability varies by country.